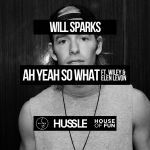 Cover version of: Will Sparks - Ah Yeah! Radio Edit 3:15 Ah Yeah So What 541 / N.E.W.S. I actually don't mind this inclusion of Wiley and Elen Levon. Good dance track! I couldn't help but be irritated when I was aware of the existence of this. Hearing it in full for the first time made me even more irritated. I'm going to put this in dot points.<br><br>⦁ I can't help but think this is Will's attempt to get in on Timmy and Joel's success with "Freaks" and "Swing" respectively. While I do like those tracks, I think that non-Savage "Freaks" is better and that Joel has better tracks. This is the same for Will, this track comes nowhere near stuff like "Bring It Back" or "When The Lights Go Out".<br>⦁ This is a vocal version of a nearly two year old track. I don't really know why he's rehashing something from early 2013 and I think it would've been better to focus on promoting something new. Also "Ah Yeah" doesn't come close to his best in my opinion so I don't think it's a good choice to promote a vocal version of it now.<br>⦁ This is inevitably going to become his biggest hit to date when it's released and that fact is making me very angry.<br>⦁ I hate how "Bourne" (which sounds like it's going to be brilliant from the preview) has (I assume anyway) been sidelined for this. I would much prefer "Bourne" getting the attention this has gotten.<br>⦁ This is just not a good recording. Vocal versions of pre-existing instrumental tracks can vary in quality and sadly this doesn't come near "Freaks" quality. Elen and Wiley bring little of substance and the vocals sound like a mess combined with the beat and "ah yeah" "vocals" from the original track.<br>⦁ The "so what" hook is very annoying.<br><br>There are some positives about this though:<br>⦁ I suppose I can't complain with Will getting more hits, since he deserves more than just two top 50 hits.<br>⦁ It will bring his music to a wider audience and he can gain more fans and hopefully he can chart better in the future.<br>⦁ If it somehow ends up trolling in the top 10 like "Freaks" it will probably be amusing to me, so there's that I guess.<br>⦁ At least "Ah Yeah" will finally chart, because it should've charted for a few weeks in March/April 2013 and should've peaked at about #70 on ARIA.<br><br>It's not the worst thing ever but there's little here for me and personally a poor release. Such a disappointment and a waste of time, effort and talent. I hope it doesn't do that well and is forgotten about quickly.<br><br><br>Edit: Well alright it is a little fun but a lot of above still applies. Really annoying that it charted so well. I have less issues with it now at least but "Freaks" and "Swing are better and also most Will Sparks songs I've heard too. The "So What" repetition is super annoying <br>but the rest saves it from a 2, barely. 2.5 ish. A pointless remix of an average, bordering on annoying dance track.<br><br>This doesn't do much for me. It is all a bit stupid. I could see how one might find this addictive for thirty seconds or so but it ends just just incredibly annoying before too long. These are dire chart days indeed. Just another mainstream clubbing song. I can't complain about Will Sparks getting more popular by the day but I would imagine this would go off in Melbourne clubs and clubs around the world, but it belongs on the club charts. As good as it is, it's only 3 stars because it just doesn't work as a top 5 singles track on ARIA.